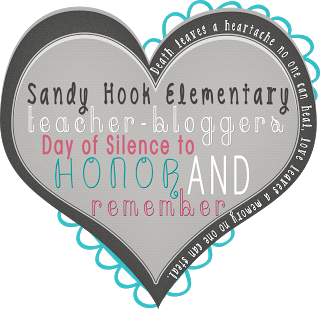 We at Blog Hoppin are heartsick over the tragedy that occurred at Sandy Hook Elementary School. As fellow teachers, our prayers and tears are with those affected by this senseless tragedy. As a form of our support for the families of the teachers, principal, and students who lost their lives, we will be joining many teacher bloggers throughout the country in a day of silence on Sunday, December 16. Simply put, we will only be posting this image on Blog Hoppin and titling our post "Silence for Sandy Hook Elementary." Please join us in this simple, but powerful memorial for the precious lives lost on Friday. Thank you to Farley at Oh' Boy 4th Grade for creating this tribute.